Jovan Pavlović was born in 1975 in Belgrade, Serbia. A composer and one of Norway’s most affirmed and active professional accordionists, he is also the leader of Tutti Serbia. Throughout his career, Jovan has been actively working on building musical relations and exchange between Norway, Palestine and the Balkan countries. Pavlović holds a degree in classical music from Trondheim Conservatory of Music, and a specialization in Romani music from the Balkans and Eastern Europe. He was awarded Yugoslav Classical Accordion Champion three times. Some of Jovan’s on-stage collaborators were Boban and Marko Marković Orchestra, Ivo Papasov, Petar Ralchev, Stoyan Yankoulov, Lelo Nika, Bojan Zulfikarpašić, Vasil Hadžimanov. He also performed with a number of Norwegian ensembles and musicians. In 2017 Jovan Pavlović Trio released their first CD Refleks. Jovan writes music for the theatre ‒ his performance Peacock was nominated for performance of the year and has been shown in the famous Det Norske Teatret in Oslo. A number of albums he has worked or collaborated on were awarded the Spellemansprisen (Norwegian prize for quality records). Jovan is a regular at Trøndelag Teater and Rikskonsertene and works as a guest teacher at Jazzlinja (NTNU). Marko Marković inherited his love for music from his father, the legendary trumpet king Boban Marković who has played the trumpet for over 30 years. In line with the family tradition, Marko started playing the instrument before the age of five and has passionately made music on it ever since. Marko and Boban have played together in the orchestra for years. Marko Marković has collaborated with many famous musicians such as Emir Kusturica, Goran Bregović, Shantel, Ivo Papasov, Esma Redžepova, etc. 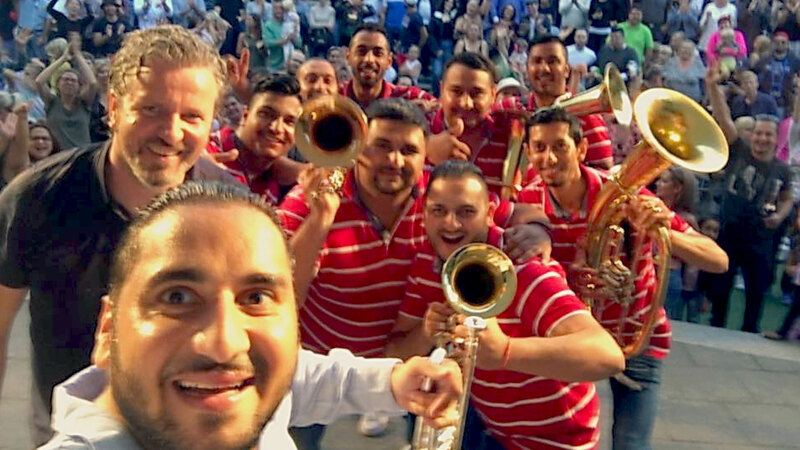 He started his own brass band in 2006 and now he is taking his hot pipes and energetic gypsy music all over the world. The Balkans live and breathe brass instrument music – a wedding or celebration cannot go by without a brass band. This is more than music, it is part of the identity, a matter of honor, their essence. The Balkan Peninsula is the area with the largest population of Roma communities, and Gypsy music with its exceptionally fast tempo and gripping energy has become one of the trademarks of the area.